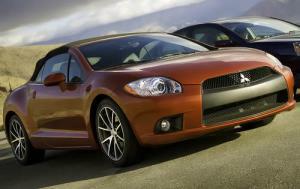 The Mitsubishi Eclipse Spyder is a convertible version of the Eclipse coupe. In most regards, the Spyder provides a similar driving and ownership experience to the coupe, which means sleek styling, four-passenger seating, a powerful available V6 and a reasonable amount of comfort. With the Spyder in the affordable convertible segment, Mitsubishi has taken a balanced approach. With nimble and sporty two-seat roadsters on one end of the spectrum and four-seat family-sedan-based convertibles on the other, the Eclipse sits comfortably in the middle. Historically, the Spyder's closest competitors have been convertible pony cars such as the Chevy Camaro and Ford Mustang. The Spyder has been available for all Eclipse generations except the first, and has occasionally dropped out of existence as new generations of the Eclipse debuted. Whether new or used, the Spyder should satisfy a shopper desiring a sporty drop top that provides plenty of wind-in-the-hair fun.